Vibration trainers have taken the fitness world by storm and are quickly becoming some of the most best-selling exercise equipment products on the market. And in this in-depth review were going to take a look at the Confidence Slim Full Body Vibration Platform Fitness Machine and let you know if it’s worth the money. So before you spend a single dime of your hard-earned cash on one of these machines make sure you read every single word on this webpage! 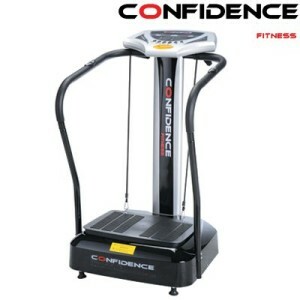 You’re looking for more information about the Confidence Slim Full Body Vibration Platform Fitness Machine. More specifically you want to know if this machine does what it says it can do, and if it’s worth the money. Well, vibration trainers have been around for a while, but lately, they have been making a resurgence in the fitness marketplace. Vibration training is all about adding the element of vibration to regular workouts. Basically, a vibration trainer consists of a base, a vibration plate that rests on top of the base, and arm rails that you use to hold yourself in the machine. You put your feet on the vibration plate, and it begins to vibrate, then you do your exercises, whatever they may be. You can simply stand still on the machine, get into a push-up position and rest your feet on the machine, or hold weights while you stand in the machine to increase the amount of resistance applied to your body. These vibrations stimulate muscles and amplify any exercises you are doing. This allows you to spend less time on the machine and get the equivalent of a longer workout. This sounds awesome, because most of us actually hate working out, and would rather do a million things other than spending time on a piece of exercise equipment. So these vibration trainers allow you to get “more bang for the buck” so to speak and will enable you to reach your weight loss or fitness goals much quicker. So How Does The Confidence Slim Hold Up As Vibration Trainer? This product comes with several different features that are important for any vibration trainer to have. Compact Size – This machine is not very big at all. It measures just 29″ x 27.5″ x 48” which makes it small enough to fit even into the most cramped rooms comfortably. BMI Function – The machine can measure your body mass index for you and give you a readout on its small screen. This is important if you’re keeping track of weight loss goals. The BMI function here is pretty accurate, and you may find yourself using it more than you use your traditional scale. User-Friendly Menu Navigation – The machine has a very simple and straightforward menu navigation program. So when you’re switching between settings or changing speeds, you can do so quickly and easily using the user-friendly menu navigation system. Wheels For Easy Moving – The machine has small wheels on it that you can use when you’re moving around. So if you like you can store the machine, pull it out for use, and then put it back into storage. The machine does weigh about 70 pounds so these wheels are definitely needed. Variable Speed Adjustment – The vibration plate on the machine has an adjustment range that can vary his speed from a setting of 1 to a setting of 50. The setting of one starts the vibrations off very slow and coarse, and as you progressively dial the speed up the vibrations get faster and finer. Included Yoga Straps For Upper Body Work – The machine also comes with a set of yoga straps that you can use for upper body work. So if you want to work your back, arms, chest, or shoulders you can use the straps to do that while you stand on the vibration plate. So What Results Can I Expect With The Confidence Slim Full Body Vibration Platform Fitness Machine? The manufacturer advertises that 10 minutes of work in the vibration plate is equal to about 60 minutes of work with regular exercise. They say that after a few weeks of using the machine two to three times a week for 10 minutes you’ll begin to notice weight loss, increased muscle strength, improved circulation, and increased bone density. This machine is said to combat cellulite as well. Out of the over 500 reviews of this product on Amazon, over 318 of them include people revealing that they have indeed lost weight and noticed other benefits such as their clothes fitting better, improved sleep, and a general increase in their overall fitness level. So as long as you use the machine as directed in addition to having a low-calorie and low-fat diet, you should see similar results for yourself. The best thing about this machine seems to be the fact that you only need to spend 10 minutes on it per day. This makes it incredibly easy to integrate into your normal daily routine. This is great because a huge problem with buying exercise equipment is getting yourself to use it on a regular enough basis to see results. As an alert, if you have joint problems, have a heart condition, or use a pacemaker it is recommended that you seek out medical advice before using a vibration trainer. So What Are The Pros And Cons Of Purchasing The Confidence Slim? No matter how hard companies try to make their products seem perfect, we all know that every product has both pros and cons. So let’s quickly go over them to help you make an informed buying decision. Easy to Use – With its simple and straightforward menu this machine is incredibly easy to use. It won’t take you more than a few minutes to start using it once you put it together. Quiet When Powered On – A problem with a lot of vibration trainers that they make a lot of noise when they are turned on. Most of the people who reviewed this product on Amazon commented on how quiet it was when it was in use. Many of them were pleasantly surprised. 6 Month Warranty – This machine comes with the manufacturer’s warranty that’s good for six months. So if anything breaks or goes wrong with the machine within this time period, they’ll replace it for free. Also, there were several reviews where people mentioned being able to get replacements for free even after the warranty had expired just because the supplier of the machine had such great customer service. Some Assembly Required – The machine does not come fully assembled in one piece, so you have to put it together yourself. It doesn’t require much assembly, but if you’re unfamiliar with putting together things like this, then you probably want to get help from someone who is to make sure you put everything together correctly. Wires Can Get Pinched During Assembly – The wires that control the menu screen can get pinched during assembly and cause a short out causing the screen not to work. You need to make sure when you’re assembling the machine that you are mindful of these wires so this doesn’t happen when you’re putting your machine together. Mounting Points for Yoga Straps Are Hard to Find – For some reason the factory does not put very visible markers where you mount the yoga straps. You need to look over the bottom base closely to find the correct mounting points for the straps. With the Confidence Slim being priced at just $249.99, where other vibration trainers cost $500, $1000, or even $2000+ this product is definitely a bargain. With so many good reviews on Amazon, and having such robust features that make it a great vibration trainer, this machine definitely gets a “Buy” rating from us. For the lowest price, quick shipping, and great customer service it is recommended that you order this from Amazon. Hopefully, you found this review helpful and you’ll soon be enjoying the confidence slim for yourself.